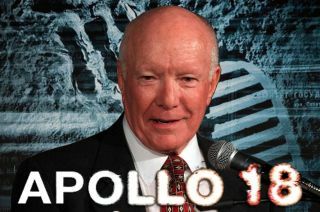 Former Apollo flight director Gerry Griffin served as technical advisor for the new film "Apollo 18" opening on Sept. 2, 41 years to the day after the real Apollo 18 mission was canceled. Every movie has a director, but for "Apollo 18," opening in theaters today (Sept. 2), a mere film director wasn't enough. To launch the "found footage" from a secret moon landing gone horrifically awry, "Apollo 18" needed a NASA flight director. Enter Gerry Griffin. During the real Apollo program, Griffin served as lead flight director for the second, fourth and final missions to land men on the moon. He might have led Apollo 18 as well, had that mission not been canceled on Sept. 2, 1970 — exactly 41 years to day before the release of the film by the same name. But if real life couldn't put Griffin back at the flight director's console, Hollywood could, and did, in "Apollo 18." Griffin served as technical advisor for the Weinstein Co. film, which seeks to re-write the history that he personally helped create. collectSPACE.com spoke with Griffin on Friday, as audiences were getting their first look at "Apollo 18." collectSPACE: How did you first hear about "Apollo 18" and what did you initially think of its premise? Gerry Griffin: "I first heard about it from a very interesting source, The Science & Entertainment Exchange, which is an office in the National Academy of Sciences. I had never heard of that before, but they evidently have an office so when someone in the entertainment business needs someone who is a scientist or has a technical background to help them with a project, they come to this exchange and from there, they can find people who can help them technically. "But long story short, I got a call from them and they asked would I be interested in talking to Michele Wolkoff, who is the producer of "Apollo 18." She called me and we chatted for a while and they didn't have a script but they had kind of a broad premise that it would be something about going back to the moon on a flight — obviously fiction — Apollo 18. "I got a draft script not too long afterwards and saw the basic premise, although it changed a lot. That was back in November of last year, and then the script got changed quite a bit since that. But the basic premise was the same: a mission back to the moon with Apollo hardware, starting out what I would call "normal" and winding up more "paranormal." "But they were interested in getting the technical look and the technical feel as accurate as they could in the limits of the story." cS: So how accurate is "Apollo 18" (other than of course the whole government conspiracy, secret mission plot line)? "The main set, when we're on the moon, was filmed in an old paper recycling factory and the thing was huge. They hauled in I don't know how many truck loads, hundreds, of dirt and rock and they brought in soil and rocks, some of it they made. "When you see the final cut I think you are going to be surprised at how well they did in one great big building. Some of the distance views that you get of the moon are actually done with a backdrop. It is not a blue screen or green screen, it is actually kind of like a mural. It has a great effect on some of those long shots." cS: What about the spacecraft and spacesuits? Griffin: "I think they got it pretty technically good inside the lunar module mockup and the command module. Pretty darn accurate. "It was the same lunar module, I think, that was used on "Apollo 13." The command module, I don't know if that was the same one. They did some work on it before we used it — in fact, in both cases — they did a little fixing up and perking up in some areas. "And they actually built on site in Vancouver the Russian LK [lander]. They did not have any drawings or anything. They had some photos of some mockups. I think one of them is in a Paris museum and one may be in a Russian museum. They literally built what they could see and it turned out very well. It was well done. "They had some support from folks out of Los Angeles that provided the spacesuits and the crew gear, like the backpacks. And they actually put together locally a lunar rover that looked very good, very accurate, for a mockup that was built by a bunch of movie guys." cS: How did they simulate lower (or no) gravity? Griffin: "In some of the longer shots on the moon, they had a harness that went up real high that had some wires that went inside the suit and then in special effects, they took those out [of the final film], to try to simulate the one-sixth [gravity] feel, particularly as they sort of bounded [about] as they were walking, taking big strides. And that was pretty good. "But for a lot of the closer work, or what I call the shorter shots, they didn't use the harness, but we tried to get them as good as we could to think one-sixth and move like they were in one-sixth, but that is hard to do. "Inside the command module, we had a little bit of wire work, but inside the lunar module, we did not because most of those shots, they were actually on the moon and so they were just standing or laying down or sitting. "I think it was done well enough that it looked authentic. And to the untrained eye, to somebody who hasn't watched a lot of people walking around on the moon, they probably won't notice. All the guys who worked at NASA and all the guys that are space buffs will probably notice some areas where that didn't look exactly right, but it's pretty darn good." cS: Did the actors do well acting like astronauts? Griffin: "The crew — the guys who played the astronauts [Warren Christie and Lloyd Owen] — worked very hard on trying to get the motions and the action and the voice and the voice procedures, the radio procedures and that sort of thing, really good. Both the guys were like sponges, they absorbed it. "And then the third guy [Ryan Robbins] that played in the command module, he came in kind of late in the game, he also did very good on short notice. "I was proud of those guys. They all did good." Continue reading at collectSPACE.com to learn what role Griffin could not serve in “Apollo 18” and why he feels movies like this are something NASA should be celebrating.